J osie graduated from the Royal Academy of Music in 2018 and now returns to the Academy with a full scholarship to study for her Masters degree with Graham Mitchell, Dominic Seldis, Tom Goodman and Cecelia Bruggemeyer. Previously she studied with David Heyes at Wells Cathedral School, where she was a specialist musician and a member of the Wells Virtuosi. 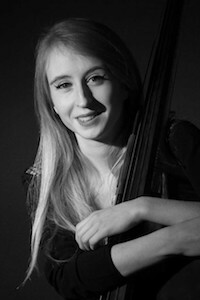 As a member of the bass department she is involved with the Academy's various Orchestral Projects, Operas and Ensembles. She has played in venues such as The Royal Festival Hall and the Wigmore Hall. As a keen Baroque player, she has played with Academy’s Baroque string orchestra many times, including a project with Rachel Podger. She has enjoyed being involved in the Academy’s Kohn Foundation Bach Cantata concerts, has performed with Margaret Faultless’s group ‘Music for Awhile’ and the Belgian Cellist Roel Dieltiens and his group ‘Ensemble Explorations’. Josie is privileged to have had pieces written for her by Sadie Harrison and Teppo Hauta-aho.